CHASKA, MN—The 41st Ryder Cup Matches will highlight the playing performances of the competitors from the two competing teams but what’s left unsaid is the unbridled enthusiasm of the home crowd. Minnesotans have flocked to be a part of the overall scene and the impact has been noticeable in a range of ways. During the final day of practice rounds which included the opening ceremonies — no less than 45,000 people were on hand. The spirit in pulling for the American squad is palpable in so many ways. Seeing a host of people — young and old — men and women — dressed in red, white and blue garb has simply filled the landscape of Hazeltine National Golf Club. The zeal that those attending have brought can be partly explained that per capita Minnesota has the highest percentage of golfer within it’s state’s population. No doubt when the long cold winter has finally ended — Minnesotans flocked to whatever golf course is near and enjoy the game until daylight has ceased to exist. The Ryder Cup is a passionate affair. After losing 8 of the last 10 encounters — including the last three in succession — the desire to finally win back the Cup and keep it on the American side of the pond has taken on an even greater emphasis. Interestingly, the Ryder Cup has been in the Midwest on a few occasions in recent years. Oakland Hills, outside of Detroit held the ’04 event where the USA squad was utterly crushed. Medinah served as host in 2012 and it was there that a 10–6 American lead going into the final day was overcome by a European team that holed nearly every critical putt on the final day. Four years from now the event will once again be in the Midwest when Whistling Straits in Wisconsin becomes the venue. Midwest audiences embrace sports no less than other areas of America. But the never ending support has one clear goal — looking for the USA losing streak to end here in Minnesota. Hazeltine has been host to other major events including two U.S. Opens and an equal number of PGA Championships — but a Ryder Cup cuts to the very core of what resonates with Minnesotans — a fierce loyalty to one’s side and a competitive fire willing to go the extra mile to achieve final victory. The opening ceremonies that took place on Thursday had people join in unison when the national anthem was played — 45,000 plus people united as one. The crowd has even gotten larger through the first day of play — close to 50,000 people made their way on the grounds and each of the four matches — in both the morning and afternoon — were encircled by a core of supporters who have made it their fundamental mission to boost every American competitor. What needs to be added is that the overwhelming number of attendees has done so without displaying the boorish behavior that sometimes comes from those who see a crude remark as being appropriate for any perceived slight that has been made. Case in point — Danny Willett. When having to distance himself from the contemptible comments made by his brother about Americans in general — the Minnesotans played a bit of jest with Willett but never crossing the line in being mean spirited or crude. 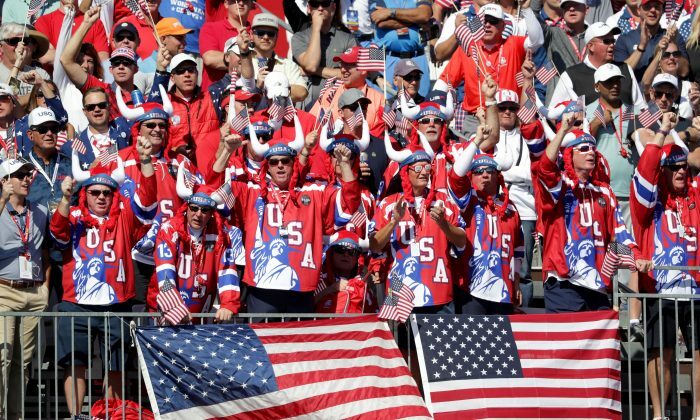 Minnesotans have come to the 41st Ryder Cup Matches and see there contribution as the missing element — the 13th man — for the 12-man American team. The USA squad will still need to play better golfer than Team Europe and no amount of vocal support can substitute itself for steely nerves as matches wind down to their ultimate conclusion. Minnesota mania is a outward display of how Midwesterners feel they can play a positive role in all things in life. Pushing Team USA rightfully through each agonizing stroke and hole in order to bring back to American soil a Cup too long absent for quite some time. Such exuberance is certainly refreshing — and every bit authentic as the people who call Minnesota home.